Love. What does it have to do with a van? I did want to talk about it; I did want you to know. I'm telling you now: the van is coming to Rome (more precisely, to the musical festival of Capannelle). But wait; let's take it step by step, otherwise you won't understand a thing. Well, it all began - more or less - at the end of last year. The story I want to tell you started at that time. 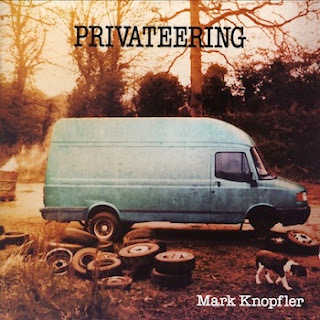 I used to drive my car listening to the three CDs of Mark Knopfler's last album, Privateering, which I had the luck to buy on Amazon, Deluxe edition. I don’t want to bore you with a review, though, for you can find one everywhere just by surfing on the Internet. Instead, I'm going to explain to you what I did (make yourself at home, get yourself a drink maybe). After having listened to the first CD for a long time, I decided to skip the second one, for I was too curious about the third one, which is the one containing the bonus tracks. At first I wasn't so sure that buying it was worth it. I mean, you know, nowadays they're always giving you these bonus CDs and when you listen to those extra tracks you only think "well, they really made a good choice by leaving them out from the standard edition". I feared such a thing. As I said, I'd already got a precise idea of what to expect. Until the day when I finally listened to it. Good heavens, after the first song, really good but not that transcendental (even if I appreciated some drum bridges very much), here comes a version of Cleaning My Gun that is more than amazing. I mean, can you believe that? I mean… if Mark (with or without van, it's not so important) is going to perform that song on stage at Capannelle (and you can bet I'll be there – I've got the ticket already), I don't know… I just can't ask for more. Also the version of Sailing to Philadelphia is really good: calm and pleasant, as it should be. "Hill Farmer's Blues" came as a surprise to me, too, with its particular and penetrating guitar riff which seems to show you that things always happen for a reason; a good one. At least, that's what it says to me. And on this basis you can build strong structures. Sure you can, 'cause you've already affirmed the positive side of everything! Now I can almost see you, telling me I've already deduced my moral from the situation. I could end like this, then. Yet it's not so and please don't go: wait (as you've not finished your drink yet, have you?). Actually, what I intended to say was a bit more elusive, decisive, and light, in a sense. It's the act of falling in love: yes sir. What always gets you. It screws all your plans, projects and strategies, your adaptation techniques, your surviving techniques. That comes always unexpected, like a sort of mystery. You can never tell. I'm not just talking about the love for a man, or for a woman. Not only. It's also about falling in love for a music, for a song, for a book, for a movie. Once it gets through your brain, new aspects, new points of view, new thoughts are free to run. You can feel energy running powerful through your veins. You feel alive. I recollect some memorable artistic infatuations. For example, Mike Oldfield's Tubular Bells 3. I've been listened to it for such a long time. It's got a particular, limpid energy… almost spiritual. The CD opens with the sound of the wind, that softly modulates a six notes structure, then reprised all through the album. Well, guess what? Still now – more than a decade after its making – when I hear the wind noise I often link it to the notes of that disc. If I don't hear them with my own ears, then I add them by myself: I add them mentally, for I consider them as an indispensable complement. Another example is Kate Bush's Aerial. Now, as you probably know, actually it's a box set consisting of two CDs. Let me say, very chic. Maybe the most beautiful CD cover among her last works. The light shade of brown, the girl at the table. Her expression. The inkpot, the pen. The window, the tree outside. The joy of the small things, redeemed by a feast of smooth colors. Look at the girl's eyes. It seems it's not you regarding at her, but vice versa: she's probing your soul. 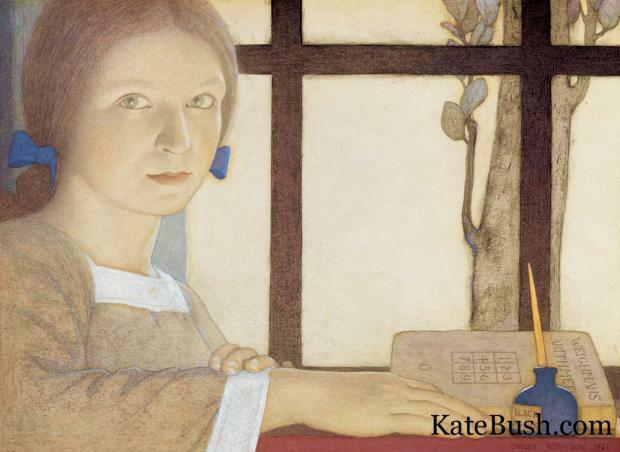 She's the one stepping forward, in spite of her apparent stillness… Don't you agree? But ok, let's talk about music. The opening of the second disk is simply amazing. You can hear the delicate notes of the piano, the voice of a child talking expressing his touching childly wonder – The sky is full of bird! – and immediately the natural call of a turtledove which will play along with yo,u all through the CD. The piano gently beats on the rhythmic structure of the call; the music is built around it, little by little. And for me there's no other way to listen to it. Now when I hear the turtledove I imagine being inside the disk. If I hear its call, I imagine immediately the repeated notes of the piano. More than a fantasy. I hear them. Tu-tu--tuu. Tu-tu--tuu. By now, something similar happens to me towards the van (well, perhaps you'll understand better now). Yes, I'm talking about the van at the center of Mark Knopfler's CD cover. When I happen to see a van even remotely similar to that one, wandering the streets, I look at it with a new affection, with a new quality of attention that I would never have granted it before. Love, affection… they have something unique. It's something owning mysterious roots, something you organize and recreate your own perception of the world around. This is true for the love of a life, for a passion, for something that arouses the sense of beauty – a work of art. There's no way. When it comes to love, everything has to be remodeled. Romano Guardini used to say: "Within the framework of a great love, everything happens soon becomes an event." And as I understand it, the same dynamic applies to all kinds of love. Every thing through which, or person through whom, the sense of a universal beauty and harmony touches us. Also through a simple van, so to speak. From a post in Italian. The Author want to express its gratitude to Claudia Castellani for the translation.